LEWISHAM: Managers have reviewed arrangements to track children missing from education and those who are electively home educated. As a result, the local authority holds good information on these groups, including up-to-date numbers of children, and has a good understanding of the reasons for children missing education or being educated at home. The local authority has a good focus on children whose parents choose to educate them at home, with a sound knowledge of the cohort. The reasons for choosing elective home education are well understood. Staff are persistent in ascertaining the suitability and effectiveness of the education that children receive and have a strong focus on children’s welfare needs. In cases where there are significant causes for concern, effective action is taken to promote school attendance and children’s welfare. 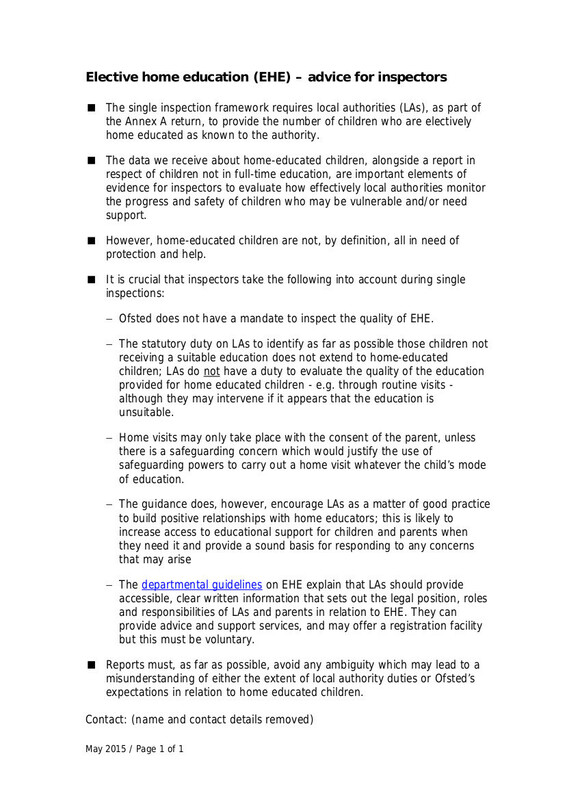 WEST SUSSEX: There are 480 children electively home educated. The local authority takes a proactive approach to children educated at home and has visited and assessed the suitability of arrangements for 476 of these children.